Some branded it a miracle, others a sign of an impending second coming and Rapture, when a divine image appeared in the clouds over Tonga. A Tonga Broadcasting Commission recent report said locals have reported seen a “blue light” in the sky. 7 News Australia yesterday published an image it said was taken by local resident, Joey Mataele, on New Year’s Day above his brother’s house in the village of Halaleva in Tongatapu. Both reports could not establish the authenticity of the photo. With a clear outline of a head, body and feet, and a golden glow from the sun, Mr Mataele believed it was a sign from the heavens, 7News said. “This is an image that was unexpected and I know it’s a miracle in my life. Thank you Lord for everything you’ve provided for me and my family,” he captioned the photo. Mr Mataele’s niece, Onelua, told 7 News Online that her family interpreted the image as Jesus. Ms Mataele, 23, said her uncle took two photos of the figure as the shape was developing. 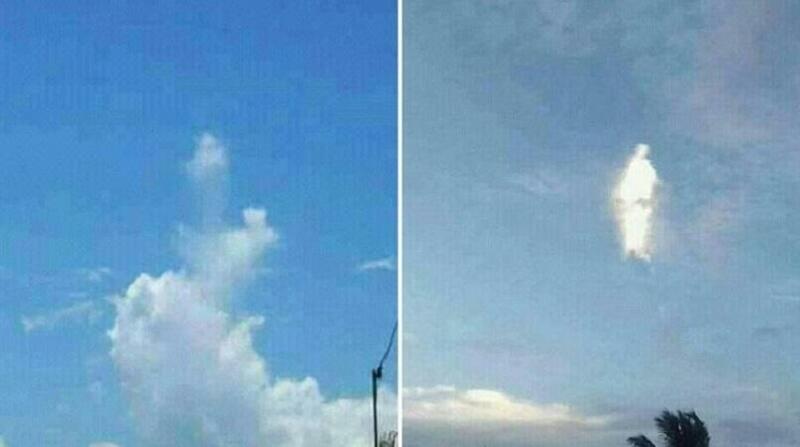 In the first photo, the figure in the sky is less prominent, and is surrounded by other clouds. But it was enough for Mr Mataele, a devout Catholic, to see an image emerging. “He took one photo and then it kept getting brighter,” Ms Mataele said. In the second photo, the rest of the clouds have vanished and the shape of a person can be seen. Ms Mataele has spent most of her life living on the property in Tonga, and said she has never seen anything like it.